I am unable to load all customer records through QODBC. I have a large number of ship to address of Customers. I have tried to execute the query using the UNOPTIMIZED keyword. But still didn't get records. I have noticed below error in QODBC logs. Please follow below steps & test again. 1. Open QODBC Setup Screen from Advanced tab Set iterator size to 10. 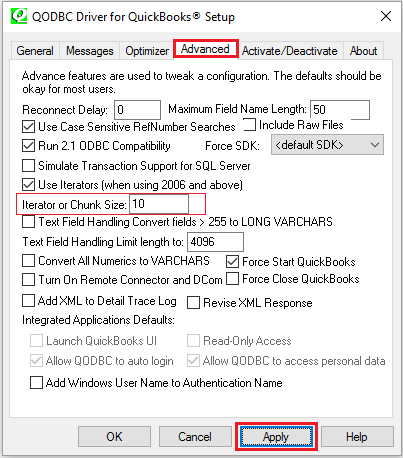 Start >> All Programs >> QODBC Driver for use with QuickBooks >> Configure QODBC Data Source >> Go To "User DSN" or "System DSN" Tab (i.e. Whatever DSN you are using)>> select your DSN >> click "configure" >> switch to Advanced tab >> Set Iterator or Chunk Size to 10 & apply changes. 2. Execute below query in the Customer table. Query the table Customer with filter ListID or FullName. Attempt to optimize the customer table through VB Demo using below query & check again. (Retry if fail).